A total hip replacement involves removing the existing arthritis and placing a metal cup in the socket and a metal stem down the femur. There is a plastic, polyethylene, liner that is placed between the metal ball and socket to provide non metal-on-metal weight bearing surfaces. After a hip resurfacing patients are generally allowed to bear weight as tolerated. A hip resurfacing is considered a total hip replacement. Surgery involves removing the existing arthritis and placing a metal cap over the femoral head and a metal cup in the socket. This allows for smooth movement of the hip joint. A hip resurfacing has the advantage of preserving more of the patients native bone of the femur. This procedure is preformed through a posterior approach. After a hip resurfacing patients are generally allowed to bear weight as tolerated. Active males less than 60 years of age are generally candidates for a hip resurfacing. 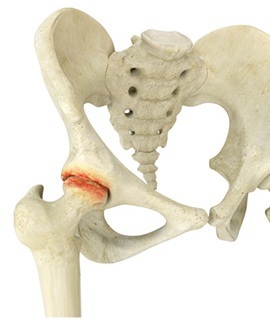 In rare cases, there may be too much damage to the femoral head in this group, rending the patient a candidate only for a total hip replacement.